If you have missed out the due date for filing the Income Tax Return and you have tax dues which are to be paid to the government, than you should first understand the interest liability that you?d incur while filing a belated return. First thing to be kept in mind while determining the interest payable under all these sections is that interest is to be calculated @ 1% per month or part thereof. So even if you are late in filing the return by 10 days, you?ll incur the interest for a whole month. Read: How to your ITR online within few minutes? The taxpayer will be liable to pay the interest @ 1% per month or part thereof for delay in filing the Income Tax Return. Mr. Darshan is a doctor. The due date of filing the return of income in his case is 31st July, 2015. He filed his return of income on 11th November, 2015. His tax liability for the financial year 2014-15 is Rs. 11,250 (which is paid on 11th November, 2015). Where the advance tax paid is less than 90% of the assessed tax*. As per section 208 of the Act, Advance tax is to be paid by the assessee if his estimated tax liability for a particular financial year is Rs. 10,000 or more. Mr. Atul is running a small business. His tax liability for the year is Rs. 32,500. He has not paid any advance tax till 31st March but he has a TDS credit of Rs 5000. Entire tax was paid by him at the time of filing the return of income on 31st July. 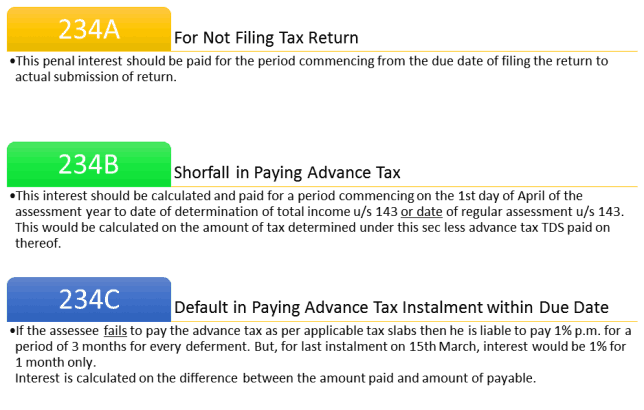 In this case, since he has not paid any advance tax, interest will be calculated from the 1st day of the assessment year till the day of paying the tax and filing the return. 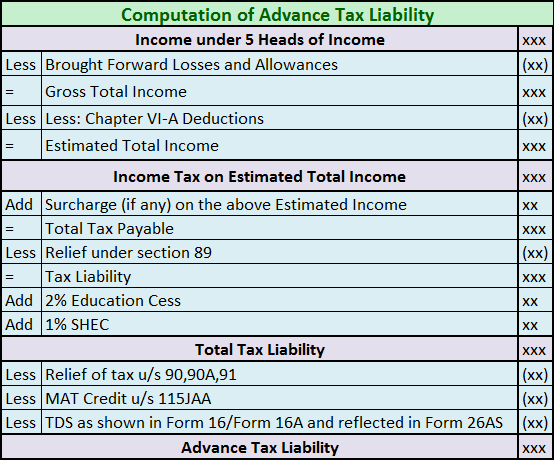 As discussed above, an assessee is liable to pay advance tax as per section 208 of the Act, if his estimated tax liability for a particular financial year is Rs. 10,000 or more. Rs. 18,400 on 15th March. Important Note: The last date for efiling of IT returns has been extended to 31st August for Assessment Year 2015-16. Disclaimer: All information in this article has been provided by Quicko.com and SimpleInterest is not responsible for correctness of the data. Quicko is engaged in assisting in online ITR preparation and filing. You can sign up with Quicko.com and efile your tax returns within minutes absolutely free and also get maximum tax refund. The author can be contacted at anand@quicko.com. How to Use Electronic Verification Code (EVC) Instead of ITR-V Sign for Income Tax Return e-filing? I have read somewhere that the advance tax to be paid are 15%, 45%, 75% and 100% as follows. Is it correct or not? Is there any change for this year from last year? As you seid this rates will applicable for the financial year 2017-18..